On 10 December, 1937, Mosley was due to address a rally of his British Union of Fascists, however the meeting was attacked by anti-fascists. 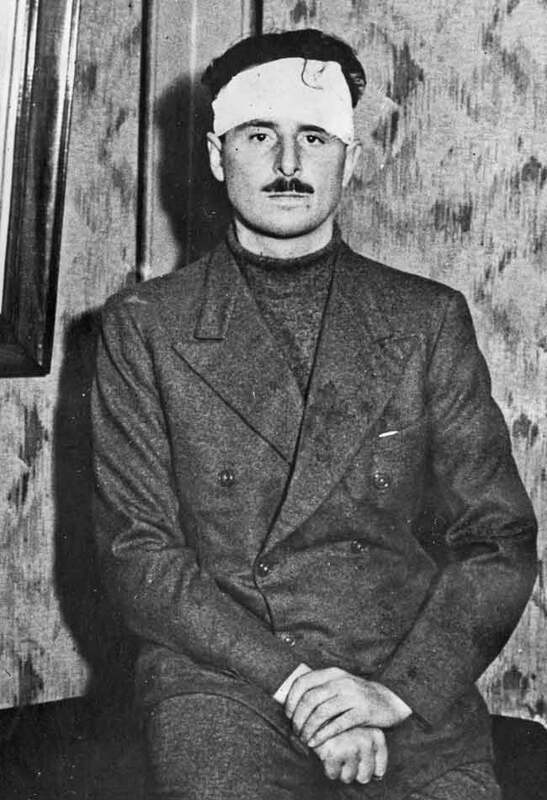 Sir Oswald Mosley was hit on the head by a stone and knocked semi-conscience immediately he stood on the top of a loud-speaker van to address an open-air meeting at Queens Drive, Liverpool, yesterday. As the van was being driven to a piece of waste land, hundreds of missiles were thrown, Sir Oswald, had not had time to utter a word when a large stone hit him on the temple and he fell on his face. Mounted police who were standing by in a neighbouring yard, immediately rushed out and charged the crowd back. A Fascist bodyguard stood by to guard Sir Oswald in spite of showers of bricks from large sections of the crowd. Mosley was rushed to Walton Hospital, where he was photographed above and discharged a week later. Liverpool was not the only place in the 1930s where the local working class would not tolerate fascism: Mosley’s fascists were also attacked by workers, anti-fascists, communists and Jews in Devon, Manchester, Newcastle, London, Stockton, and elsewhere. The BUF was disbanded in 1940 when it was proscribed by the British government after the start of World War II. After the war Mosley formed new fascist groups, but again these faced stiff opposition and were again smashed off the streets by anti-fascists, including the 43 group of Jewish ex-servicemen and later the 62 group. Mercer, Derrik, ed. (1989). Chronicle of the 20th Century. London: Chronicle Communications Ltd. p. 488. ISBN 978-0-582-03919-3.